He has also lived in Barcelona, The Hague, and currently resides in New York. He studied composition and electroacoustic music with Chilean composer Gabriel Brncic at the Phonos Foundation in Barcelona and flute with Hiroshi Kobayashi and Joan Bofill, also in Barcelona. He holds a BA in Anthropology from Hunter College in New York City. Most of Arias's music is improvised and made in collaboration with other musicians. Apart from occasionally playing the flute, he uses unconventional instruments and found objects as sound sources. He has performed with a shifting array of small found objects, amplified with piezo-electric transducers. Since 1992 he has focused almost exclusively on The Balloon Kit, a number of rubber balloons attached to a suitable structure and played with the hands and a set of accessories, including various kinds of sponges, pieces of Styrofoam, rubber bands. His tape pieces have been heard at the Ciclo Nuevas MFAsicas (Montevideo), Festival Synthese (Bourges), Instituto Colombo-Americano (Bogotà), and The Institute of Sonology (The Hague), among other places. He recently presented an installation piece at the Zeppelin Sound art Festival in Barcelona. 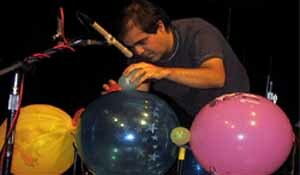 Arias has published essays in Experimental Musical Instruments (Vol, 13, #2, 1997), and Leonardo Music Journal (Vol. 9, 1999).